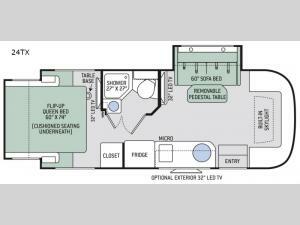 If you are looking for a slide out in the main living area, cushioned seating and a flip-up queen bed slide in the rear, plus a complete bath then take a look inside this Thor Motor Coach Gemini class C diesel motor home. Enjoy your meals at the 60" sofa bed plus there is a pedestal table which can easily be removed when you are ready to convert the sofa into a sleeping spot at night. The built-in skylight above the cab allows for so much natural lighting throughout. When you are ready for a little entertainment then come enjoy the living room 32" LED TV, the bedroom 32" LED TV or the optional exterior 32" LED TV. What are you waiting for? You don't have to be a spectator any longer, come be a participant and start travel the country with this Gemini 24TX! When the going gets tough then answer the call of comfort and relaxation with a Gemini class C diesel motor home! Each model is built on a Ford Transit chassis or a Mercedes-Benz Sprinter. With the rotocast storage compartments you will have room for all of your belongings. The power patio awning with integrated LED lighting is a nice feature and allows plenty of shade plus you can sit outside just a little bit longer once it has gotten dark out. Inside enjoy the easy to clean, and take care of residential vinyl flooring, plus there are added touches throughout each model with the Euro-style cabinet doors with soft close hidden hinges and nickel finish hardware, premium window privacy roller shades and a convection microwave oven. Come start your next vacation with a Gemini motor home!